In the seemingly never-ending quest to find the perfect, light weight graphical file manager, I have gone through just about every one I can find. So far my favorite has been Thunar (see Thunar content on Ghacks for more information) which comes standard with a few distributions. PCMan File Manger can be found in the LXDE desktop environment and was totally rewritten by the creator (Hong Jen Yee) to resolve some on-going bugs. What we now have is an incredibly fast, easy to use, light weight file manager that will please just about any level of user. And best of all, it can be added to nearly any distribution. So if you are unhappy with your desktop's bulky file manager, I'll show you how to install and use PCMan File Manager to lighten up your desktops' load. Search for "pcmanfm" (no quotes). Issue the command sudo apt-get install pcmanfm (in Ubuntu) or yum install pcmanfm (in Fedora). NOTE: If using Fedora you will have to su to the root user before you issue the command to install. When finished, close your terminal window. That's it. PCMan File Manager should now be installed. Let's see what it looks like and how it's used. To start up PCMan File Manager click Applications > System Tools > PCMan File Manager. When you do you will see a fairly standard looking file manager pop up in next to no time. The GUI is about as straight-forward as you can get. 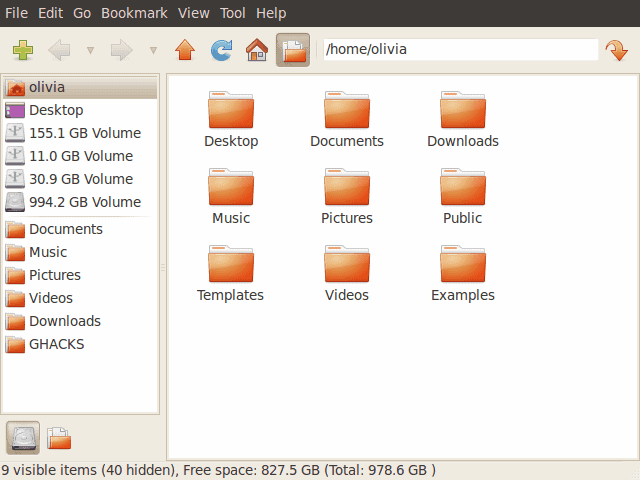 In fact, the GUI almost resembles that of Nautilus from the GNOME desktop. If you're not fond of the Location view in the left navigation pane, you can switch that to Tree view by clicking the folder icon in the lower left corner. Once very nice feature of PCMan File Manager is that you can very quickly open up your terminal of choice by either clicking F4 (when PCMan File Manager is open and has focus) or by clicking Tool > File Manager. Of course, before this will work you have to configure the file manager you want to use. To do this click Edit > Preferences and then click on the Advanced tab. From this tab click on the Terminal drop-down menu to select which terminal program you want to use. Outside of that, PCMan File Manager works just as any file manager would. You can drag and drop between different file managers if you like and, as stated above, drag and drop files between tabs (to create a new tab click CTRL-TAB). If you're looking for an incredibly fast, easy to use file manager you shouldn't have to look any further than PCMan File Manager. It doesn't have all of the features it's older siblings have, but it works incredibly fast and will fit well on your light and snappy window manager. cd menu-cache && ./autogen.sh && ./configure && make && sudo make install-strip && cd ..
cd libfm && ./autogen.sh && ./configure –sysconfdir=/etc && make && sudo make install-strip && cd ..
Also, I think you mean hit Ctrl + T not click Ctrl + Tab. So it has thumbnails. Can they be resized? Thunar’s JPG &etc. thumbnails are too small on today’s monitors. They can be resized, but it’s a pain. You can set a custom thumbnail size (from 64×64 to 256×256), but it doesn’t work (for me, at least). Seriously? No serious file management can take place in a single pane. Any file manager worth it’s salt has to be dual pane. The best file manager ever invented, Directory Opus, of Amiga fame (and now available on windows), is by far the best ever written. If someone were to clone or port Opus to Linux then we’d have the perfect filemanager. At the moment the only ones that come anywhere near it are konqueror and/or Dolphin if you don’t mind less features. I don’t know why file management seems so hard to get right on Linux. It’s not like it’s a new concept and hasn’t been done perfectly in other places. There are these things called tabs that seem to be in pretty common use these days. Maybe you’ve heard of them? So you don’t get some of the keyboard shortcuts, not a big deal if you are working in a GUI, using a mouse. The trade off of not having the keyboard shortcuts is that you can have multiple tabs open at once, drag something to a tab, hover briefly waiting for it to come to the foreground, continue to drag to a destination folder within that tab. The only thing I can think of right off the top of my head, that I actually use, that tabs can’t give you is that side by side comparison of directory contents, preferably with the option to use color coding to highlight files that are different or only exist in one of the locations. It’s called “PCMan File Manager” after “PCMan” the alias of Hong Jen Yee Not “PC File Manager”. You can’t even get its name correct. Disappointing and frustrating, I’d scanned the article from top to bottom and back and then back again before I realised this article was talking about the much-loved PCMan File Manager or PCManFM. What is the author up to? Is it trolling, designed to generate traffic of the “look what this idiot has just written” variety? sorry everyone. I’ve made the changes to the article to reflect the correct name. don’t know where i managed to pull that name out of. It’s a good article; however you didn’t mention how we can make PCMan our default manager. Would you mind explaining how to do so in a way us beginners can understand? Thanks.